Against the odds, a young man pursued and lived his dream of being a firefighter and befriended many along the way. Fighting against the odds, Christopher Ainsworth pursued his dream of being a fireman and often rode with the trucks. Born May 4th 1979 to Curtis and Joretta Ainsworth, Christopher Lee Ainsworth came into the world by emergency c section weighing only 3 lbs.13 ozs. After 6 weeks in the hospital, Chris reached 5 lbs and was able to go home. Once home, Chris' parents noticed slow development. After several doctor's visits, tests showed that Chris had cerebral palsy. Chris also developed seizure disorder. The doctors said that Chris would never walk, but he did. Chris was saddled with casts for several months and having to wear leg braces every night for a year. By age 4, Chris was walking, eventually, he learned to run. By age 5, Chris was playing for the Shriners basketball team, and later he would play in special Olympics. Chris was involved in track and field, and went to state, and Chris played soccer. Growing up in school, Chris was often ridiculed by other kids, but Chris just smiled, laughed, and displayed a never give up attitude that helped Chris gain many more friends than foes. in 1998 Chris graduated high school in Shepherd. While Chris held several jobs, his dream was to become a fireman. Chris had the privilege of training with the Atascocita volunteer fire department. Chris eventually moved to Livingston. In 2011, Chris met Livingston Fire Chief, Corky Cochran and eventually became an honorary Captain for the Livingston Volunteer Fire Department. A passionate Christian, Chris loved Jesus, loved his pastor, and played guitar in church. Chris was a doer. Always defying the odds, he proved the doctors wrong again. They said he would never make into his 20s, but he Chris made it to 32. Chris passed away on January 26, 2012. Two days later, the Livingston Volunteer Fire Department, headed up by Chief Corky Cochran, gave Chris the full fireman's funeral and burial. Chief Cochran delivered a eulogy and at one point, told how Chris always said that he had the Chief's back, "Chris had the heart and spirit of a true fireman" Cochran stated, "...he allowed us to be a part of his life", he said. Chief Cochran spared no expense and had the full honorary service complete with a Scottish style bag piper, all the fire engines (including fire engines and trucks from surrounding VFDs, some from outside Polk County). At the conclusion of the service, Captain Ainsworth's casket was carried by firemen and emergency personnel decked out in dress blue firemen uniforms receiving a salute from Chief Cochran as he passed the chief, and a salute from local firemen as he passed a double row of the firefighters all in dress blues. Ainsworth was loaded onto a fire engine and transported to by a full convoy of law enforcement units and fire engines to Peebles cemetery where a final service was held and he was laid to rest. At the burial, the bag piper played amazing grace, knelt at the foot of Ainsworth's casket, stood up, an slowly walked away until the bagpipes could no longer be heard. Proud Momma, Joretta with her kids. Ainsworth met Livingston Fire Chief Corky Cochran in 2011. Captain Chris was a Christian and very active in his Church. 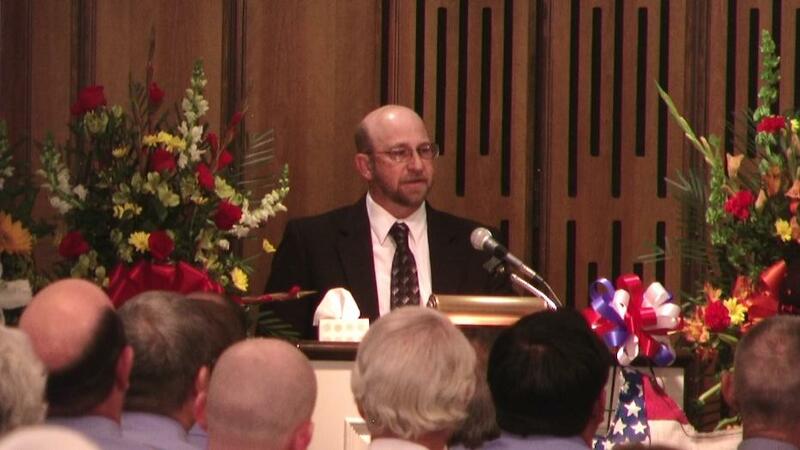 Deep Down Strength: Chris' dad, Curtis, delivered a eulogy at his own son's funeral.